What a very strange weekend it was . . .
LOML offered to take me out of town for dinner and a night at a hotel, but I chose to stay in town and watch college football instead. Fortunately - Alabama won. It was a nail-biter and an overall good game though. We tried to hook up with a few friends, but that never worked out. THEN, I got pissed at the place we went to watch some more football, because they changed the big TVs to games that held no interest (Iowa) and then to a UFC (fighting) thing. I was SO MAD!! We left early, me a bit downtrodden. My spirits were raised on Sunday when we visited with my family. We carved pumpkins and ate gumbo. 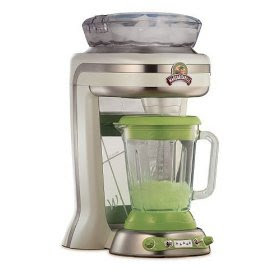 I got one of those AWESOME Margaritaville Blenders (frozen concotion maker) from my family. I can't wait to use it!! We also had a yummy Tirimisu cake that my mom ordered from New York. As soon as the cake was eaten, we got a call that a close family friend had passed. Seriously! LOML and I left soon after and went to see a movie before finally heading home. It was a busy weekend, but definitely left my spirits dampened. Perhaps that's why I was having all those ill feelings about my birthday in the first place. It was destined to be. . .less than celebratory. On the other hand, the outpouring of good wishes I received via twitter, Facebook, blog comments, and e-mail was overwhelming. A BIG HUG and THANK YOU to all of you for thinking of me, if only for a moment. It really meant a lot!! The conclusion of my birthday, means one thing - the lead up to Halloween!! I've saved a bunch of links from last year and a few this year to share this week. Let's get this party started with some Halloween-Themed "Made Me Smile Monday"
How about these owl cookies - they look good enough to, well, eat. They are also not completely Halloween specific and can totally be made any time of year. Beer Fairy costume - LOVE IT!! Lastly, does anyone have any great blended drink recipes for me to try in my NEW, AWESOME machine? I've got the bushwacker and margarita down pat (well, not for this machine, YET) and I can make a pretty mean smoothie. But, if you've got any other suggestions, recommendations, or if you wanna come over and try it out, lemmie know!! Ohhh - anything for Halloween perhaps??? Sorry about your birthday! We will celebrate when I come into town next month. :-) And I just have to tell you...I didn't realize that the Margaritaville was a REAL THING!!!! There is an entire South Park episode about them. hahaha. Thanks honey - I could use something to cheer me up. Yes, it's real. Pat said something about there being an episode but he couldn't remember what it was about. I meant to FB message you this morning and ask what it was about, but I forgot. We could have a good time with that thing!! It was a really good episode...its purpose was to explain what was wrong with the economy. The Margaritaville ended up being worth like 3 trillion dollars, according to the government. It was hilarious. Just a suggestion if you didn't already know this, when we did football up here for the AL/Ole Miss game we made these really simple frozen drinks. Frozen pink lemonade, frozen strawberries, and vodka. Sooooo good! You should try that out in your fancy machine! I'm sorry your birthday was less than stellar. I wish I had a great drink to share for your blender thingy but I'm an old fuddy dud. Hope the Halloween kickoff will be nice for you! Jennifer thanks for the concern! !